This catalog features artwork from SAQA's Wild Fabrications exhibition. Also included is a foreward by Kristin La Flamme (SAQA Education Committee) and essay from Juror Geoffrey Gorman. Wild Fabrications celebrates a world of animals both real and fantastical. 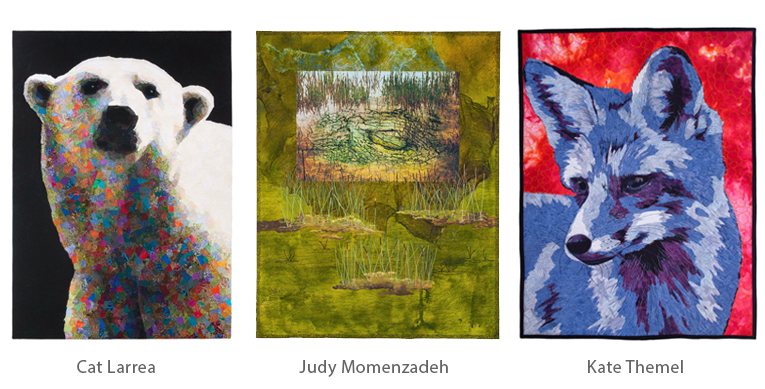 Selected artists let their imagination run wild and created interesting and unusual interpretations of animals using unexpected or unconventional materials and adornment, and/or unusual techniques. The theme not only lends itself particularly to bold colors and whimsical imagery, but also to beautiful realism, and humor that can be ebullient or dark. We must remember that man is himself a beast, and that we impinge upon the habitats of animals as much as they on ours. By sharing the intriguing and inspiring qualities of animals, these artworks serve as reminders that conservation and understanding is necessary in order to maintain the natural world in which we live.